Experience exceptional performance, immersive entertainment and simple convenience with 8th Gen Intel Core processors. The i7 8086K processor extends all the capabilities that users love from previous generation CPUs with even more advanced innovations that deliver new levels of performance immersing you into your computer on a variety of form factors. 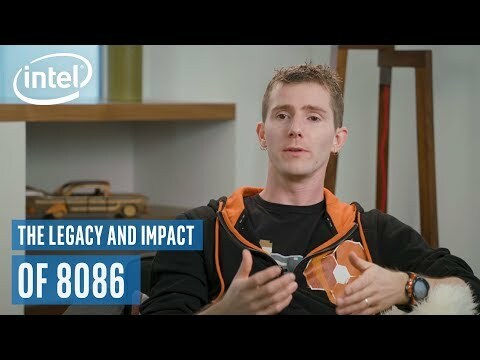 The 8086K features all the latest Intel technologies to allow you to have the best computing experience, this particular CPU is a limited edition processor that becomes Intel’s fastest ever. Please Note: Intel 8th. Gen 'Coffee Lake' CPUs are ONLY compatible with Intel Z370 Motherboards. Although these Intel 8th. Gen 'Coffee Lake' CPUs share the same socket as Intel's 7th & 6th Gen. CPUs, they are electrically incompatible & will not work with Intel's 200 & 100 Series Motherboards. The 8th Generation Intel Core processors redefine mainstream desktop PC performance. The i7 8086K features six cores for even better processing power, aimed at gamers who want a higher-frequency chip for a better gaming experience. Being a K-series processor, the Core i7-8086K also has its multiplier unlocked and is ready for overclocking to even more extreme speeds, should you feel the need. Intel Turbo Boost 2.0 technology increases the maximum turbo frequency to 5.0 GHz whilst Intel's Hyper-Threading Technology delivers 12-way multitasking support in the latest generation of Intel Core processors so you can work even more efficiently. It’s been 40 years since Intel have forever changed computing with the x86 architecture and the 8086 processor. Since then, the usage of computers and how they influence everyday life have changed dramatically. The Core i7-8086K's 5.0 GHz clock speed is also 1000 times faster than the original 8086. A high-performance processor is key to achieving a balanced platform to make your VR experiences great. Attach your premium head-mounted display (HMD) to an Intel Core i7 or i5 processor-based PC, and prepare to be amazed. The performance of the 8086K processor allows for the smoothest virtual reality experience yet. Keep in mind that great VR experiences involve the entire platform, not just any one component. The ideal combination of processor, graphics, I/O connectivity, display, and audio are required, but be assured that this LIMITED EDITION 8th Gen Intel Processor won’t let you down. Desktop computers based on the 8th Gen Intel processors integrate advanced media technologies that bring premium, high-quality content to your desktop, including HEVC 10-bit encode/decode, VP9 10-bit decode this delivers smooth streaming of premium 4K UHD entertainment to your PC from leading online providers. The Intel i7 8086K provides full-size, screen-immersive viewing experiences with 4K video and 360-degree viewing, Enables incredible 4K video creation and sharing with ease, and it finally allows High Dynamic Range (HDR) and Rec. 2020 (Wide Colour Gamut) for life-like luminesces to provide enhanced image and video viewing experiences. Intel Quick Sync Video technology accelerates most video capabilities, allowing users to create and share in real-time. 8th Generation Intel Core processors integrate hardware-level technologies that strengthen the protection of your enabled security software. Hardware-based security helps you experience online and offline activities with peace of mind, enabled by features that include Intel Software Guard Extensions (Intel® SGX) that helps applications protect your system and your data coupled with Intel® BIOS Guard and Intel® Boot Guard that help protect your system during start-up. The 8th Generation Intel Core processor family is a great investment in your desktop experiences—whether for gaming, entertainment, or general-purpose computing wherever your life takes you. From the jaw-dropping performance of the Intel Core i7 processor with six cores to the practical capabilities of the Intel Core i3 processors, our latest generation of desktop processors fits a wide range of budgets and needs. Whether you’re a performance-hungry professional, an exceptional enthusiast, or a first-time buyer, there is an 8th Generation Intel Core processor that will enable the experiences you seek. If form factor is your priority, the 8th Generation Intel Core processor family offers a range of processors designed for desktop PCs from high performance gaming towers, to slick and stylish all-in-ones, to compact living room minis. Increases the processor’s frequency, as needed, by taking advantage of thermal and power headroom when operating below specified limits. Intel Core i7 8086K, S 1151, Coffee Lake, 6 Core, 12 Thread, 4.0GHz, 5.0GHz Turbo, 12MB Cache, 1200MHz GPU, 95W CPU, Box is rated 4.5 out of 5 by 4. Rated 5 out of 5 by mynamajeff from Sorry? What's a bott- bottleneck? Is that how you say it? Skip to the bottom if you can't be bothered to read all this:) I suppose as processors go, being expensive and all that, this one sets new boundaries, as described with it's 'limited edition' specs. As the first one Intel produced to reach 5GHz overclock it certainly delivers on what its reputation precedes it with. As you can probably expect, I like my PC games. More specifically, hugely graphically intensive ones. (they have to be fun as well obviously) It probably goes without saying that you really don't need this very high functioning CPU unless you're rendering something on a daily basis or playing intensive games. It's 2019 and I'm still decimating Black Ops III Zombies whenever I get the chance. I use this as an example as it takes a whopping 125GB of hard drive space with all the DLC and therefore was stressful to load up. On top of this my i5 4460 was bottlenecking when playing and sometimes failed to even start up the game. The i7 8086k goes up to 4.2GHz from 4.0GHz base speed when I start it up. Admittedly, I've had to upgrade the motherboard and RAM to get this processor as it's S1151, however my GPU has remained the same. The GPU is almost entirely responsible for loading these intensive games in high graphics, and my GTX 1070 8GB worked a charm doing so. However, an inferior processor in comparison to this powerful GPU doesn't make such a good mix. Aaaaaaaannndddd then there were the bottlenecks. Now, however, this game starts up every time without fail and doesn't bottleneck, GTA V is very similar. Especially with menu screens. A lot of menu screens jarred my FPS before I upgraded but now they don't. The product has a nice exterior packaging, with its sleek Coffee Lake design and feels premium. Just thought I'd also mention in case people hadn't noticed or were upgrading from 4th gen like I did: IT DOESN'T COME WITH ITS OWN FAN LIKE THE MUCH EARLIER ONES. TLDR? Fair enough. To sum it up briefly, it has a great look, runs beautifully and all my intensive games run in their highest settings without jarring FPS. DO NOT BUY THIS JUST FOR EVERY DAY WORK. It's far too expensive for the sake of Microsoft word or whatnot, unless you have a lot of cash to splash. Only buy this for helping your GPU run intensive games or render large video files efficiently. 5 stars. Rated 5 out of 5 by tisho1012 from Perfect for gaming! My sample is able to get to 5.2ghz/1.344V, ASrock z390 Taichi. Cooling it with Scythe Ninja 5 with two Be Quiet SW3/1450 rpm, 120mm fans. For 24/7 I am running it 4.9ghz 1.150V and on this settings benched on OCCT, small data set, I get like 75-77 degrees C when the ambient is 23-24 degrees C. This is really hard test, so in gaming the temps are lower than 70C, which is what I am aiming for! I can run it 5ghz, but I prefer to keep my CPU lower than 70C. If I delid it I am sure I can run it full time 5.2Ghz, something that I can not do with i9 9900k cooled with an air cooler, that's why I went for this one, can easily get to 5.1/5.2Ghz, it can be delidded easier than i9 9900k if needed, and it can be handled better than its bigger brother with an air cooler. Cheers! Rated 3 out of 5 by DanielCor7ez from Is same as i7 8700k on performance is same as i7 8700k on money is 150 pounds more . Rated 5 out of 5 by MrLondon from An excellent CPU for everything. This CPU really is a powerhouse. It is pretty expensive, but you get what you pay for. It is very close to the 8700k, but slightly quicker. Easily deals with Video, Image and Audio rendering, Gaming and everything else I throw at it. Its very quick and efficient. Nope, you need a z370 MB. In the cpu specs it says Max Memory speed DDR4 2066? So if i install DDR4 4000 RAM, it would only run at 2066?